The electric/hydraulic pump is available with either a 1 horse power or 1.5 horse power with 115/230 volt 50/60 HZ motors which draw a maximum of 17 amps. The electric pump will operate all single acting and dual acting cylinders, depending on the control valve option selected. 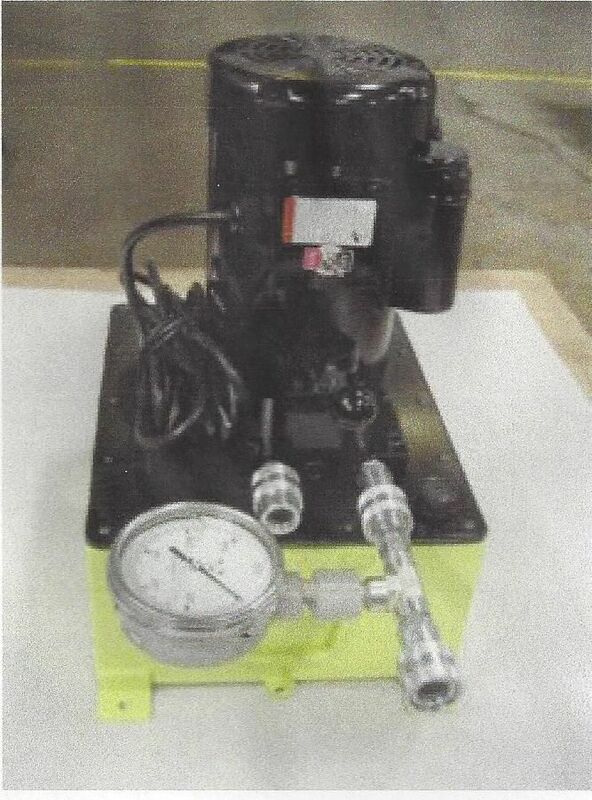 This is a two stage pump, the 1 HP model supplies 450 cu in./minute in the first stage and 36.5 cu in./minute at 10,000 P.S.I.in the second stage. The optional 4-way valve control assembly (shown above), is added to the pump for operation of all dual acting cylinders. Electric 3 & 4 way solenoid valves, electric pendant switch and 5 gallon reservoir are available options. All of the pumps meet or exceed ANSI/ASME B310.1 Safety Standard and ISO 9001.208 Standard while providing 10,000 P.S.I. of hydraulic pressure to the hydraulic cylinders. Internal factory preset safety valves protect the operator, pump and cylinders from over pressurization. The 2 gallon usable capacity reservoir is standard. Our pumps will start under full load, run on reduced voltage, and draw a maximum of 17 amps at 110/230 VAC making them ideal for use with utility or generator supplied power. The integrel two speed operation provides rapid cylinder advance and quite operation, combined with a maximum 80 DBA sound level at 10,000 PSI. Additional pump flows, reservoir capacities, and power options are available to meet your individual needs. Call for shipping weights which vary based on options selected. Ships via FedEx Ground ®.